This was another restaurant I had wanted to try for some time. I pass it every day on my way to work and, more importantly, my nephew works in the kitchen helping to prepare each days menu. Four couples converged on this Main Line eatery in late November. We had to scramble to find a parking space but that may be due to the fact they had two VERY large parties, one of 40 and the other 32, dining there at that time. Our table for eight was located and the only deterrent was the noise but that might be expected when 40 family members are gathered to celebrate a birthday just a few feet from our table. 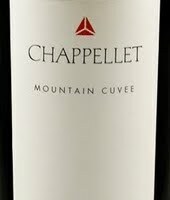 333 Belrose, not being a BYOB, we perused the wine list (most bottles coming in at about 3 times retail) and selected a couple of bottles of the 2008 Chappallet, Mountain Cuvee, a blend of cabernet and merlot that offers rich fruit flavor with hints of cinnamon and other spices. It went well with all of the entrees chosen and on its own. Several in our party selected the Wood Grilled Jail Island Salmon with garlic mashed potatoes and broccolini. I thought the fish was tender and cooked to perfection and the sauce added just the right additional flavor. The garlic mashed potatoes were sumptuous. Those who didn’t opt for the salmon gravitated toward the Char-grilled Filet Mignon. Some had it as pictured here with steak fries. My wife substituted the fries for blue cheese mashed potatoes which she raved about. She gave me a sample and although they were good I thought the intense blue cheese flavor slightly overpowered the meat. But, hey, what do I know?? My nephew popped out of the busy kitchen just long enough to present our table with a complimentary sampling of some of their excellent desserts. We all shared a couple of plates of their New Orleans style bread pudding with a warm whiskey sauce, a flourless chocolate cake with raspberry sauce and creme fraiche and a third tasty item that I don’t quite remember its name. Overall, it was an excellent evening. The noise died down somewhat and what could have been a kitchen disaster with 70 to 80 orders arriving at the same time was handled flawlessly by the staff. 333 Belrose is certainly a Philly Main Line restaurant that deserves more frequent visits. 333 Belrose is a restaurant that I would pass by daily on my way to work in King of Prussia. It was a place I always wanted to try because it is in the area (Radnor, PA) where my wine buddies and I would have frequent wine dinners, we always went somewhere else because it wasn’t a BYOB. I recently learned that my nephew, Ryan, worked at the restaurant. In addition, researching the menu online, it appeared to offer some interesting entrees and on top of all this, the review from diners were invariably very good. So, when I suggested the site as a possibility for some of our friends, there was no dissent. We made reservations for a Friday evening for a party of eight (8). Parking near the restaurant on weekend nights can be a bit of a hassle but we found something nearby and arrived right on time. We had a nice table in the corner of the bustling eatery and while the others conversed, I reviewed the not very extensive wine list, which consisted of about 12 reds and 12 whites, a few by the glass with most bottles being priced between 2 and a half and three times retail. 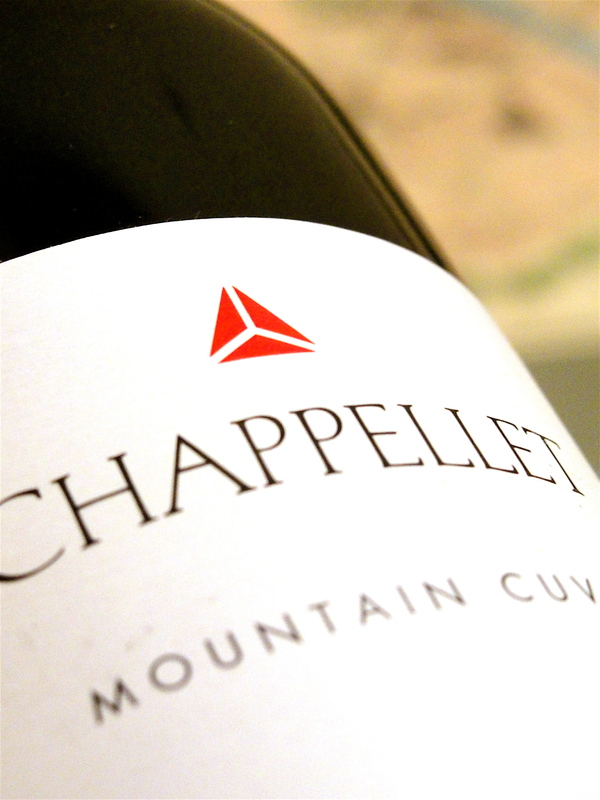 We settled on a couple of bottles of Chappellet, Mountain Cuvee, a $25.00 red blend listed at $63.00 on the wine list (THIS is why we love BYOB’s). Made up of mostly cabernet and merlot, this one had vibrant fruit flavors with hints of spice and cinnamon and went well with both the meat and fish dishes on the menu. I should point out that we arrived at 333 Belrose just as a party of forty (40) were entering to celebrate a birthday. In addition, another party of thirty-six (36) were seated adjacent to us in another room. Although this could have thrown a wrench into service for the evening, I would offer serious kudos to the kitchen and service staff for handling things well. Several of us began our meal with the Bacon, Lettuce and Tomato Salad, applewood smoked bacon with blue cheese dressing. As I have mentioned many times, any variation of the Wedge Salad is tops in my book and this one with its fresh produce was no exception and a great way to start the meal. Those who chose to forego the BLT Salad selected the Belrose Butter Lettuce Salad which consisted of crumbled blue cheese , candied walnuts and shaved Granny Smith apples. With lots of interesting items on the menu and a couple of nice “specials” it was difficult to settle on an entree choice. After a lengthy deliberation I decided to go with the Wood Grilled Jail Island Salmon served with Sour Cream Mashed Potatoes, Garlicky Broccolini and Sauce Bernaise. 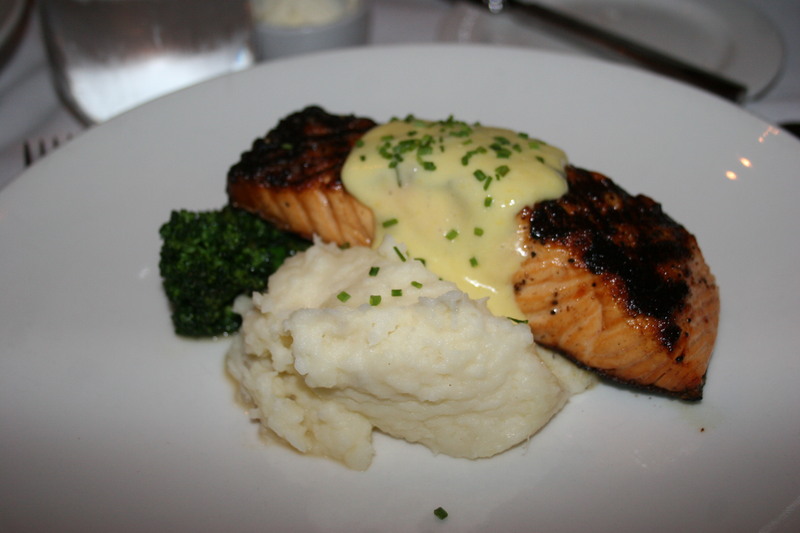 The salmon was nicely charred, full of flavor and went perfectly with the absolutely delicious sour cream mashed potatoes. The broccolini was fine although not my favorite choice of a veggie. Several in our group chose the House Cut 14 oz. 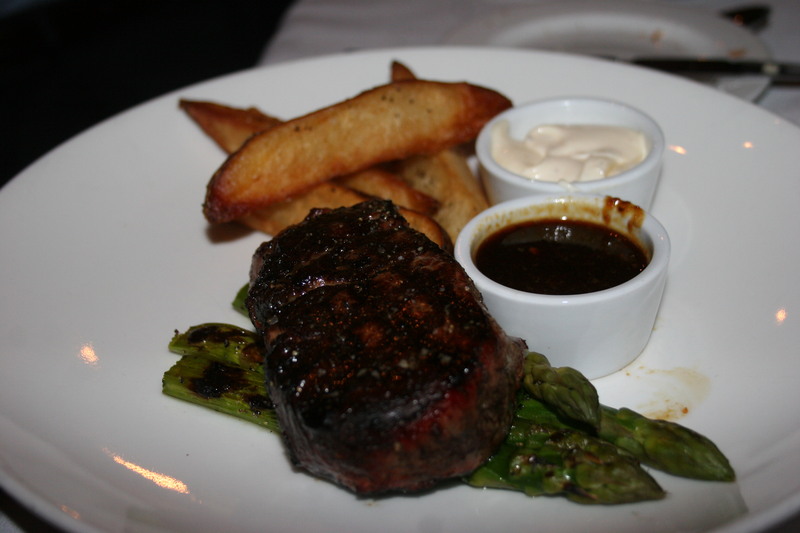 Strip Steak with crispy salt & pepper steak fries, grilled asparagus and 333 steak sauce with truffled aoili dressing. My wife had the Char-grilled Filet Mignon with blue cheese mashed potatoes, honey-glazed carrots and a cracked-pepper brandy demi-glaze. She thoroughly enjoyed her steak and even shared a portion of her meal with me. I thought the steak was great but felt there was too much blue cheese flavor in the mashed potatoes, As usual, she thought I was nuts! 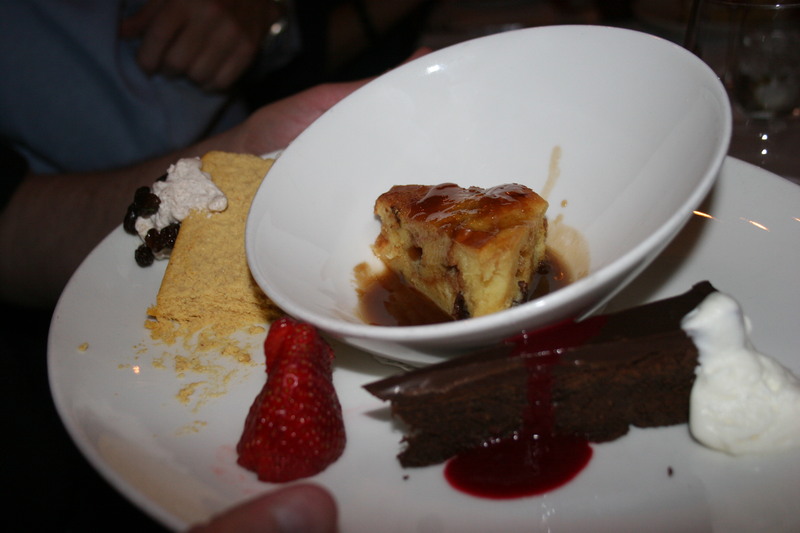 My nephew surprised us with a complimentary dessert tray he had created featuring the New Orleans Style Bread Pudding with Warm Whisky Cream Sauce, a New York Style Citrus Cheesecake and a Flourless Chocolate Cake with Raspberry Sauce and Chantillty Cream. It was just the right ending to a wonderful meal. If 333 Belrose were a BYOB we would be making frequent trips to Radnor to sample more of their enticing menu. For those of you who are not as finicky about being able to bring your own wine to a restaurant, 333 Belrose should be one of your choices for fine dining on the Main Line.